Bravo Loncheria serves up tortas – traditional Mexican sandwiches – in a slick, modern atmosphere. In the pink-hued gloom of Dulce Patria's dining room, my steak arrives borne by a white-shirted waiter. The meat is grilled in the arrachera style, cooked just-medium and deftly seasoned with garlic, thyme and rosemary. It's thinly sliced, topped with a delicate nest of crispy fried onions and served alongside a tamale, a steamed bundle of corn meal and black beans wrapped in a banana leaf. With great ceremony, the waiter works with a fork and spoon to remove the wrapper and deposit its contents onto my plate. It's an awkward process, like watching a robot attempt to tie a pair of sneakers, and his careful efforts result in the tamale landing with a wet thud on the white tablecloth in front of me. The waiter apologizes profusely, absconding to the kitchen to summon a replacement tamale. Mexico City is a place whose culinary identity is inextricably bound to street food, the ubiquitous mobile kitchens hawking tacos, tortas and tamales on every street corner, and Dulce Patria is one of several top restaurants that have endeavoured to elevate these simple dishes to the realm of haute cuisine. The basic formula is the same as you'd find outside any metro station, but the ingredients, methods, and of course, price, are entirely befitting of a fine dining establishment. When the new Dulce Patria tamale emerges from the kitchen and is successfully unwrapped on my plate, it is superb. The cornmeal is buttery and pillow-soft, the beans delicately spiced and bearing a faint trace of smoky roasted chiles. Street food has made the transition to white-linen establishments, but it's not without the occasional logistical hiccup. Bravo Loncheria offers tortas, a food as common as tacos in Mexico, but with sophisticated fillings including braised short ribs, fried squid and smoked marlin. The sandwiches are more expensive than street tortas, but not necessarily superior. "I will not order a tamale in a restaurant," says Ubish Yaren, a guide with culinary tour operator Eat Mexico, who spent the previous day walking me through his favourite street-food stalls. Yaren is something of a street-food evangelist, a passionate booster of Mexico City's curbside chilaquiles and bicycle basket tacos de canasta. "A tamale is something that you eat quick on a rushed morning, it's something you can take away." He's not the only local who might raise an eyebrow at the theatrics of the high-end tamale, not to mention the price. Indeed, that the tamale's banana-leaf wrapper acts as both cooking vessel and disposable plate is no accident – this is food that has evolved over centuries to be as economical as it is nourishing. It's one of several questions raised by a growing food scene that's borrowing increasingly from Mexico City's humblest dishes. "This is like something you'd find in New York City," says Yaren, outside Bravo Loncheria, a new tortas shop done up in varnished wood and exposed concrete. Tortas, Mexican sandwiches stuffed to the gills with avocado, cheese and assorted meats, are on par with tacos in popularity in Mexico City, and are likewise moving on up the culinary ladder from their humble roots. Bravo Loncheria's sophisticated sandwich fillings include braised short ribs, fried squid and smoked marlin, and I'm ready to order when Yaren pulls me away. Street food, both abundant and delicious, forms the foundation of Mexico City’s diverse culinary scene. "The ingredients here are more expensive, but it's not better," he says, leading me to a torta stand along a busy stretch of sidewalk. Yaren orders and I watch as a sandwich comes to life in front of me. Turkey carved from smoked drumstick, avocado, chipotle chiles in adobo, creamy Oaxacan cheese and a thin slice of breaded and deep-fried beef called milanesa are piled onto a large sesame seed roll, and topped with a handful of aromatic bitter greens. It is, without a doubt, one of the best things I have ever eaten. The creaminess of the avocado and cheese are balanced by the crunch of the milanesa; the whole thing tied together by the rich, deep spiciness of the chiles. My enjoyment of the sandwich is clearly evident (I may have made some noises to this effect) and Yaren nods with satisfaction. He told me so. If there is a happy medium between the theatrical heights of haute-cuisine street food and its original "authentic" form, it can be found at Contramar, a seafood institution in the trendy Roma Norte district. 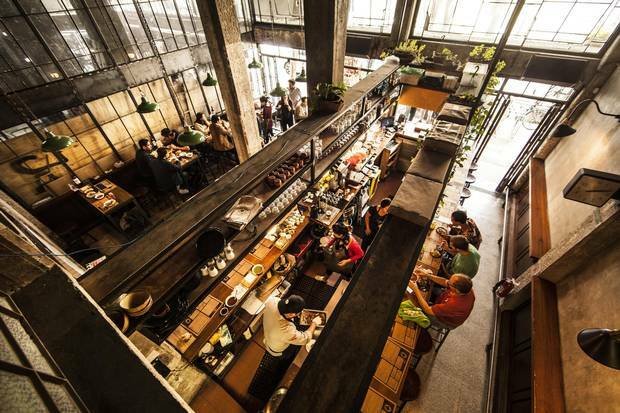 It's an upscale place, with vested waiters and a nice wine list, and on a weekday afternoon it's full of fashionable Mexicans having post-work drinks and a bite to eat along its shaded sidewalk terrace. Tostadas de pulpo, fried corn tortillas topped with marinated octopus, fresh salsa and avocado, are a common sight in Mexico City. The thing to order here, I've been told by more than one knowledgeable foodie, are the tuna tostadas. Tostadas, crisp fried discs of corn topped with meat or seafood, are a street food staple across Mexico. Born out of the need to make use of day-old tortillas, they are one of those simple snacks that are good pretty much anywhere you find them. Contramar was among the first restaurants in the city to see the potential in tweaking this ubiquitous street food to make it appeal to a more discerning clientele. As with all restaurants offering tweaked versions of simple dishes, the benefits of having a comfortable place to sit, a well-crafted ambiance and a liquor license cannot be underestimated. Street birria, stewed beef tacos accompanied by a spicy tomato and onion broth, is praised locally as a potent hangover cure. Here, however, the food itself is revelatory. Perfectly crisp wafers of corn are topped with slices of raw yellowtail tuna, buttery wedges of avocado, and ribbons of fried onion. The tostadas are served alongside a creamy salsa verde and a dish of eye-wateringly hot sliced chiles, but a squeeze of lime juice is all that's needed to reveal the perfect formula for street-food-gone-fancy. It's neither an elaborate presentation nor a whimsical take on a classic: It is a simple dish elevated by high-quality ingredients and precise preparation. I devour the tostadas and consider ordering another round right away, but think better of it. In a city that's this serious about food, there are incredible meals to be found on every block, in top-ranked restaurants and on a plastic sidewalk stool. The only way to go wrong is to not arrive hungry. Tacos de Canasta, ready-made tacos sold from a basket, are among the boundless snack choices to be found on Mexico City’s streets. Air Canada and WestJet fly direct from Toronto to Mexico City. The one-way trip takes about five hours. The writer travelled as a guest of the Mexico City Tourism Trust. It did not review or approve this article.